Another feather in the cap of an already accomplished man. Franklin already enjoyed great success as a printer and author, was instrumental in founding a subscription library, and spearheaded the American Philosophical Society. He was in his 40s, and in many ways just getting warmed up. Franklin’s newspaper, The Philadelphia Gazette, didn’t require his constant attention by the 1750s. This afforded him the leisure time to pursue his interest in science and scientific experiments. By 1750, Franklin had devised the lightning rod. He knew that if lightning storms were an electrical phenomenon as he surmised – and tall metal rods can attract that electricity away from other structures – he was on to something really useful. 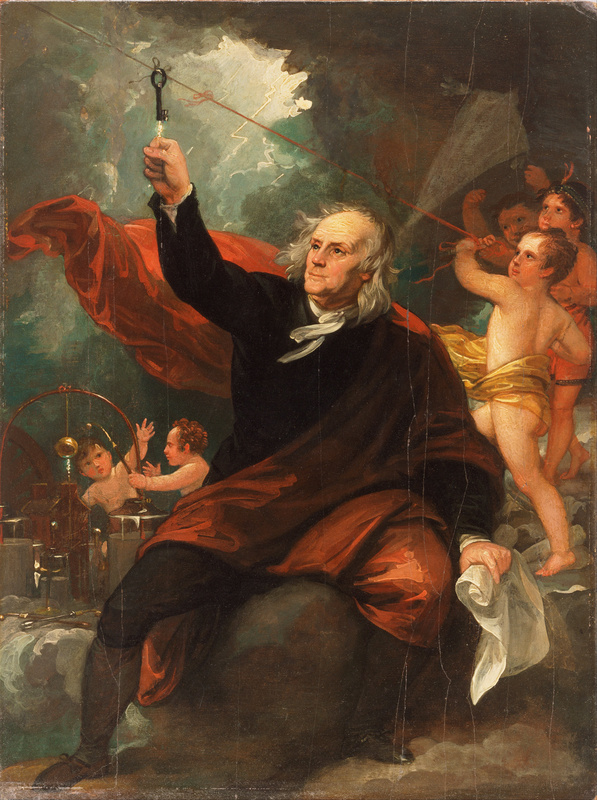 The iconic kite experiment is one of the most famous moments of American and scientific history and is indicative of Ben Franklin’s ingenious and impetuous spirit. Franklin’s research into the study and applications of electricity was groundbreaking and won him the Copley Medal from the Royal Society in 1753. He introduced many terms now in common usage today, such as electrician, battery and conductor. The Doctor, having published his method of verifying his hypothesis concerning the sameness of electricity with the matter of lightning, was waiting for the erection of a spire [on Christ Church] in Philadelphia to carry his views into execution; not imagining that a pointed rod of a moderate height could answer the purpose; when it occurred to him that by means of a common kite he could have better access to the regions of thunder than by any spire whatever. Preparing, therefore, a large silk handkerchief and two cross-sticks of a proper length on which to extend it, he took the opportunity of the first approaching thunderstorm to take a walk in the fields, in which there was a shed convenient for his purpose. But, dreading the ridicule which too commonly attends unsuccessful attempts in science, he communicated his intended experiment to nobody but his [21 year old] son who assisted him in raising the kite. The kite being raised, a considerable time elapsed before there was any appearance of its being electrified. One very promising cloud had passed over it without any effect; when, at length, just as he was beginning to despair of his contrivance, he observed some loose threads of the hempen string to stand erect, and to avoid one another, just as if they had been suspended on a common conductor. Struck with this promising appearance, he immediately presented his knuckle to the key, and (let the reader judge of the exquisite pleasure he must have felt at that moment) the discovery was complete. He perceived a very evident electric spark. Others succeeded, even before the string was wet, so as to put the matter past all dispute, and when the rain had wet the string he collected electric fire very copiously. This happened in June 1752, a month after the electricians in France had verified the same theory, but before he heard of anything they had done. Perhaps most prominently among those who doubt Franklin on this matter include author Tom Tucker, who accused Franklin of making the whole thing up in Tucker’s book “Bolt of Fate: Benjamin Franklin And His Fabulous Kite.” He purports Franklin didn’t conduct the famed experiment at all and just said he did to goad French and British scientists. Many historians disagree with this theory, as it completely goes against Franklin’s character and modus operandi, as well as would have risked his considerable reputation as a scientist had such a ruse been discovered. It’s one thing to make jokes in his works, as Franklin was exceptionally prone to do, but falsifying scientific data simply wasn’t something Franklin ever is known to have done. With so many verifiable achievements to his name, risking his reputation on an embellishment would hardly have been worth it just to goad a few scientists across the pond.